"I wanted to run within 40 minutes of my time 40 years later," said Joan Benoit Samuelson, who won the Boston Marathon in 1979 and finished again in 2019. It was 1979 when Joan Benoit Samuelson won the Boston Marathon. To celebrate the 40th anniversary of her historic win, the 61-year-old crossed the finish line again Monday, running the course in just over three hours. "I feel older, but not that much older," Benoit Samuelson said. "I wanted to run within 40 minutes of my time 40 years later, and that meant a 3:15, and I ran a 3:04." Also finishing the race on Patriots Day was former New England Patriots linebacker Tedy Bruschi, a stroke survivor who ran to raise money for research. With it being his third Boston Marathon, he now has as many medals as he does Super Bowl rings. "At first, I didn't know how to be a runner. I trained for 8-second bursts for my entire career," Bruschi said. 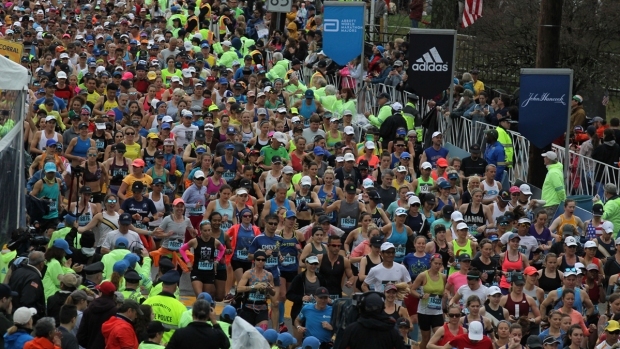 For the first time, the race fell on the anniversary of the Boston Marathon bombings. The significance of the date was not was not lost on marathon finisher and NASCAR driver Jimmie Johnson. "We lost somebody close to the Hendrick Motorsports team that day," Johnson said. "Sean Collier was a security guard at MIT and was lost trying to apprehend the bombers. His brother worked in our engine shop, and I've been able to meet with his family and spend time with them." Among the most inspiring runners were amputees. Air Force veteran Adam Popp lost his right leg in an IED explosion while he was deployed in Afghanistan. He met with countless Boston Marathon bombing survivors while they recovered, making his run all the more meaningful. "It's just incredible to see them when I'm here because it's a special day for them," Popp said. "They have ran or handcycled the marathon since then, and it just shows the human spirit is not defeated." Popp said he is not stopping at the Boston Marathon. He is flying to France on Tuesday with the goal of running a 50-mile race.